No introduction this time around, we’re diving right into the stories with some of the best science fiction published in 2010, as collected in Year’s Best SF 16. Two young teens living on the West Coast of Africa discover a technologically advanced teddy bear in the near future. It made its way from California to Africa with a shipment of used and discarded computers which one of the teens, Aminata Diallo, disassembles as her day job. The teddy bear is a toy for rich kids, kind of like a future version of a Tamagotchi mixed with a cellphone. Aminata’s brother uses the bear (named Jelly) to become a chess hustler. The kids are put in a situation where they have to use Jelly to steal money from other people’s bank accounts in order to help their drunken father get out of a pinch. It’s an odd little story that I can’t help but feel is probably accurate to the way of life in undeveloped countries. The teens don’t know much about the world outside of their city but they know enough to be able to hustle and steal from others using whatever means they have at their disposal. What I call stealing isn’t considered stealing in the way the kids in this story understand it. They steal to survive, basically. The most chilling and interesting part of this story is the idea that ownership in the modern world is a combination of might makes right and licensed usage of a commodity. Do you truly own your apartment or is its usage license out to you for an agreed upon fee? There are interesting ideas at play here but Crowell seems more content on showing a particular way of life today and how it might look like in the future. A neat exercise but not one that is particularly exciting. As a near future story it’s not really my kind of thing. Other than putting the fear of identity theft in the forefront of you mind for a few minutes and providing the reader with a look at how technology does and will continue to affect undeveloped countries, the story doesn’t have much to offer. This story is almost a masterpiece. I say almost because I think I’m still internalizing and absorbing what I’ve just read. “Futures in the Memories Market” is about a woman named Geeta who has a heightened sensitivity to the world around her. She experiences human senses in a way that the vast majority of people can’t. It is so intense and captivating that her memories are recorded, cleaned up and edited with the purpose of them being sold so that others can experience her memories. In the future, memories are commodities to be sold. People like Geeta are hired to acquire these memories and they’re brought to different locales and planets to do so. In order to be prepared for sale, the memories must be extracted from Geeta, leaving her without memories and also without any lasting personality. The process is one of permanent extraction. It’s not about making a copy of her memories. Each day Geeta acquires new memories she develops a new personality, based on her experiences of that day. At night, she sleeps while being plugged into a machine that forcefully takes her memories and leaves part of her mind a blank canvas, receptive yet again for the next day’s events. When a person “emps” a purchased memory, they get to experience them as that other person did. Geeta’s heightened senses are part of the memories. You can temporarily step in another person’s sensory experience. You can be that other person. Memories, personalities, identity, all are related to experience and all can be shared. Hoffman expertly navigates these complex subjects while crafting a poignant story between Geeta and her bodyguards. It’s hauntingly beautiful. As far as plot goes this is slight but if you consider the inventive and enchanting future described in the story, you can’t help but be impressed. Hoffman’s prose is descriptive and a little poetic. She writes with a subtlety befitting the subject matter and it makes for a really good read. Vernor Vinge is yet another science fiction writer I’ve been planning on trying out. Just like Joe Haldeman and Robert A. Heinlein before him, I’ve got a book of Vinge’s patiently waiting for me on the bookshelf. For the curious out there, it’s a nice looking copy of A Fire Upon the Deep which I found at my local used book store. 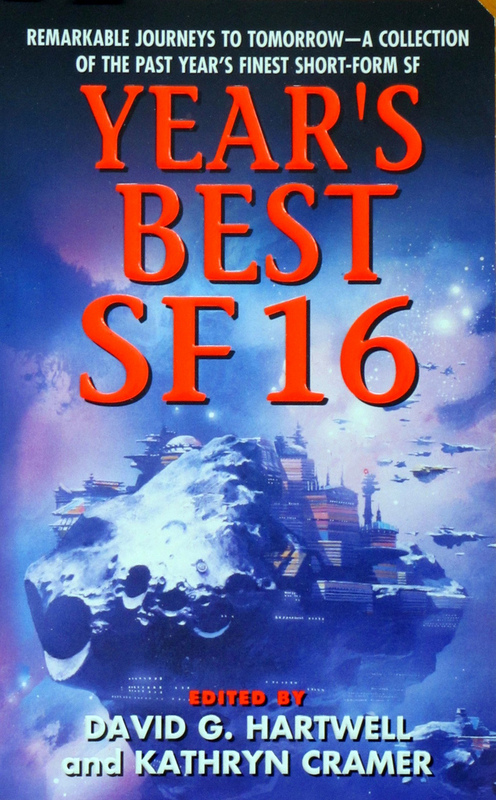 It looks like a dandy good read, full of hard sci-fi goodness. I’m glad I got a chance to sample his style with this story because it was a pretty damn good one. Presented like an excerpt of Captain Lee’s memoir (just like the title promised) this story is about a planet similar to Earth’s originally called Lee’s World and later changed to Paradise. After a couple decades of scouring the galaxy for inhabitable planets, Lee and his crew discover “the most earthlike exoplanet known”. After making his discovery Lee returns to the planet with a crew of scientist along with the media. What results an interesting look at what future space exploration might look like, including media hype unconcerned with any kind of accuracy, rival scientists, petty squabbling, re-evaluations of old theories designed to determine the number of extraterrestrial civilizations in the galaxy, and several more neat ideas, all of which as skilfully presented by Vinge. The result is a rich tapestry of exploration and bureaucracy. There are a lot of details packed into this story and I’ll be rereading it again soon to unpack some of those details in order to look at them with a new perspective. I liked the ideas, I liked the subtext, and it was skilfully executed. What more do you want? Well, to be honest, I would have liked it to be about twice the length. Next week I branch out a little and include a third book into my Short Story Sunday rotation. That’s crazy! I hope you’ll be here to witness it. Until then, check out this in-depth interview with NinaKiriki Hoffman at Strange Horizons.